I am daunted by the prospect of commenting on this book. 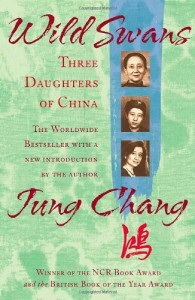 Jung Chang tells the story of her grandmother who was a concubine to a warlord general before marrying a compassionate and principled Manchu doctor, and was one of the last generation to suffer the disabling practice of foot-binding. She tells the story of her mother, revolutionary, committed communist, wife of a passionate political leader, whose support for the regime finally collapsed in the face of inexpressibly extreme onslaughts of violent purges, violations of basic rights and erasure of all culture and knowledge except 'Mao theory'. It's overwhelming just to read of the sufferings she and her generation struggled through. That these things actually happened somewhere leaves a mark on my chest. She tells her own story of precarious survival and struggle for scraps of education under the terrifyingly unstable regime, and of her indoctrinated worship of Mao. Her father's status sometimes allowed her family certain privileges, but these could be snatched away at any moment. When she finally wins the right to leave China, even under restrictions, the relief for the reader is intense yet unbearably conflicted by the sorrow for all those who did not escape hunger, misery, brutality and death. That Chang found herself able to bear witness is a gift. Every word of this work is a memorial to those lives narrowed, broken and wasted by a political agenda that deemed them cheap enough to sacrifice.